Bids to purchase the dog park property were due on Wednesday, February 20, 2019 and WMATA is now reviewing them. Among the bids are two that could save the park. First, one bid is from the District, which has promised to preserve the entire park. This bid meets WMATA’s requirement to sell the land for its fair market value—indeed, WMATA itself set $2.1 million as the fair market value—and would meet the community’s need for a full-sized dog park. We have urged WMATA to choose this bid, and if it does, we will move forward in improving our park. A second bid, by Outlier Capital Realty, includes a plan to build housing as well as a community dog park of about 4,000 square feet in size. 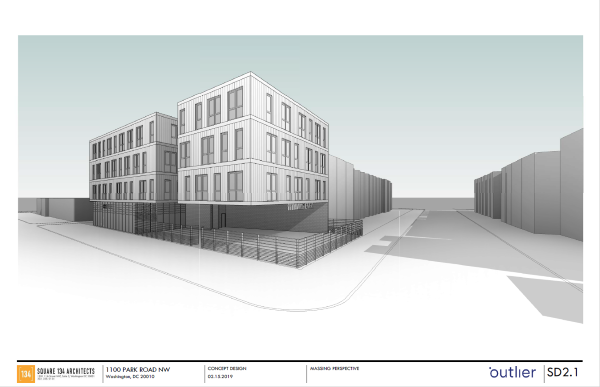 The design would provide housing, retail and an important community green space: a public dog park. Outlier's design calls for a concrete podium 15 feet above the ground, with most of the park underneath that podium. We asked WMATA to select the Outlier bid if they reject the District’s bid so that we can ensure we will have a dog park on the property. Of course, WMATA might also accept another bid entirely. Would the dog park be for residents who live in the community or just people who live in the building? The dog park would be a community dog park open to the public. Would there be running water and trash cans (for dog poop)? Yes. Outlier has promised to work with us to create the amenities in the park that we want. Who would maintain the park? Outlier would maintain ownership, but they'd like to have a partnership with 11th and Bark, the District, or both. 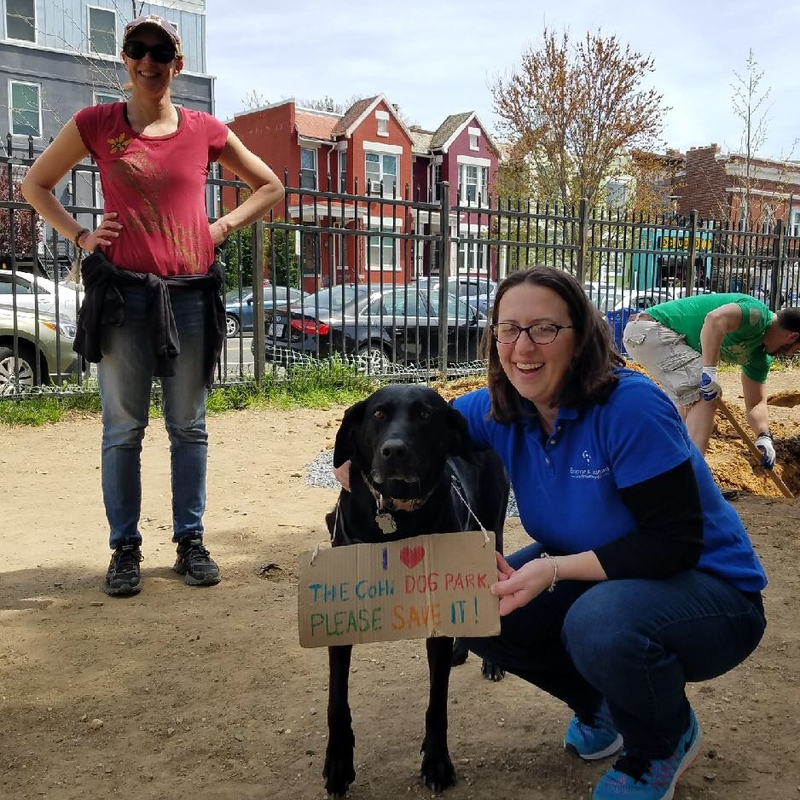 With the current District dog parks, neighborhood groups are tasked with some of the maintenance of those parks, so it wouldn't be unusual for the nonprofit to take on some maintenance. How does it work to have a dog park under a building? It could be the first of its kind. But Outlier recognizes that the area will need lighting and ventilation. Also, at least a section of the park would be open to the sky. What would the surface be? We don’t know yet. If they win the bid, they promised they will work with us to figure out what surface works best. Outlier has offered to spend some time at the park, answering questions about the design. Please email us and let us know if you would be interested in that. What can you do? Contact WMATA. Ask that it select the District's bid, and if not, to at least select the bid that saves most of this valued community space. Biznow’s Jon Banister writes Dog Owners Face Off With Developers In Push To Preserve Park Space. The piece quotes NoMa BID President Robin- Eve Jasper who said: "I feel like some of the folks who are saying you can have affordable housing or dog parks and you have to choose between them, it's juts a false dichotomy.” She continued by explaining “You have to have a healthy neighborhood with many assets and components to that neighborhood. The idea you wouldn’t have space for people to come together and that you don't need those spaces is silly." There's a for sale sign at the dog park, but we can still save it. As you likely know, the Columbia Heights Dog Park sits on property owned by WMATA, which has allowed us to use the space for our dog park since 2009. In the last few years, WMATA has shown interest in selling the property. Knowing this, the community urged the District of Columbia Council to purchase the land. More than 1,500 District residents (both those with and without dogs) signed a petition, local businesses submitted letters, and our ANC representatives passed a resolution in favor of saving such green spaces in our neighborhood. The Council heard us and allocated money in the FY2019 budget to buy the land. Now, WMATA has officially listed the property for sale and is accepting bids, which are due the end of February. 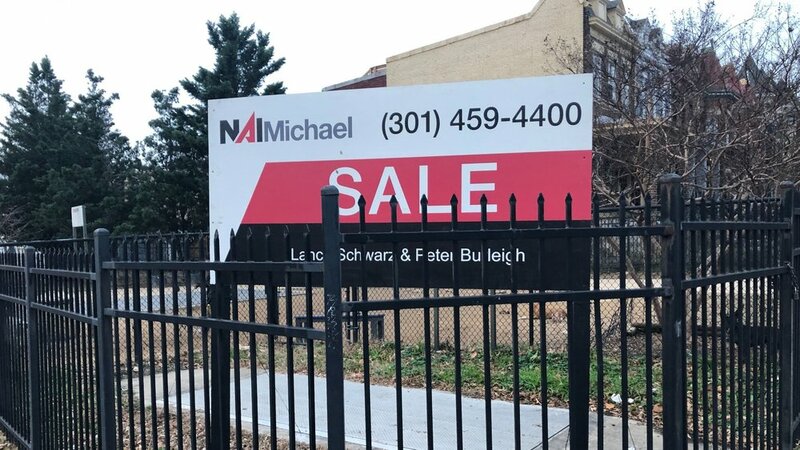 That is why the for sale sign suddenly appeared in the park. The District did make an offer to buy the land, but WMATA rejected it. The fight to save the park, however, isn't over. We now need Mayor Bowser to make a fair market value offer on the property. On Wednesday, January 9, ANC1A adopted a resolution, introduced by Commissioner Angelica Castañon (1A06), to show support for the mayor making a fair market value offer. Now it’s your turn. Please take a moment to ask the mayor to make this offer. Olympian Gus Kenworthy just rescued a new pup named Birdie. The Humane Society International saved Birdie after she was born on a meat farm in South Korea, and then Gus came to DC to adopt her from the Animal Welfare League of Arlington. What was one of their very first stops after she was adopted? That’s right—the Columbia Heights Dog Park! Thank you Gus for saving dogs and for your dedication to making others aware of the cause. Thanks to the overwhelming support for the dog park, the Council has allocated funds to save it. 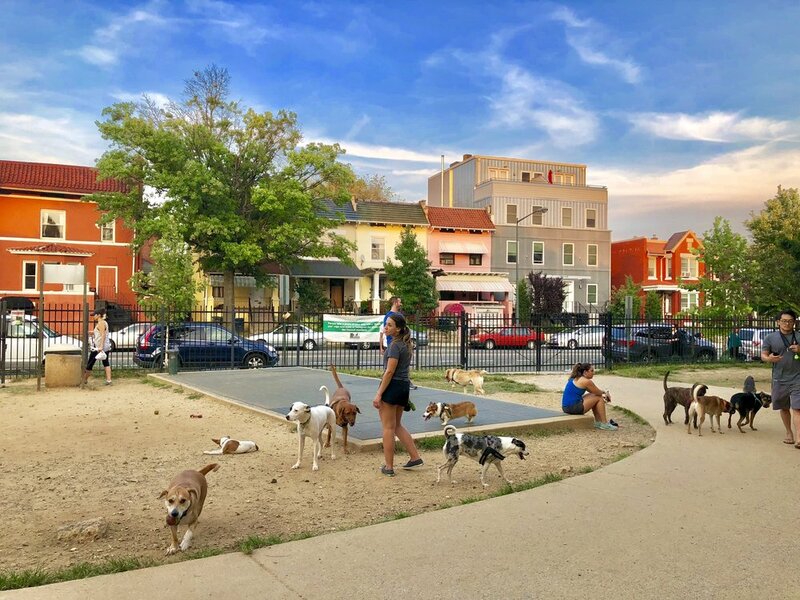 The FY2019 budget includes $1.5 million to purchase the Columbia Heights Dog Park from WMATA. The Council's final vote on the budget was May 29, 2018. The budget is now on the mayor's desk, awaiting her signature. Ward 1 Councilmember Brianne Nadeau supported our efforts to obtain funding for the park. Members of the Council deserve our thanks. You can send them an email to thank them here. Next, the District and WMATA will have to negotiate the sale of the property, and dog park supporters need to start raising money to share the costs of improving the park. You can donate to our efforts to improve the park here.